Kentucky Three-Day Event will host the CSI3* $225,000 Invitational Grand Prix on the "Best Weekend All Year." The 2018 Kentucky Three-Day Event will host a new CSI3* show jumping competition as part of its schedule of international equestrian competition. 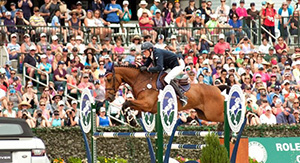 Equestrian Events, Inc. (EEI), producer of the Kentucky Three-Day Event, in partnership with the Split Rock Jumping Tour will host the new $225,000 Invitational Grand Prix. The Kentucky Three-Day Event, America’s only Four Star Three-Day Event, returns to the Kentucky Horse Park, April 26-29, 2018. The new $225,000 Grand Prix will be held in the Horse Park’s Rolex Stadium on Saturday afternoon following the completion of the CCI4*’s Cross-Country phase. In addition to the $225,000 Invitational Grand Prix, which will feature 30 international riders, there will be a $35,000 1.45m FEI ranking class on Friday afternoon following the completion of the CCI’s dressage competition. Guilherme Jorge, show jumping course designer at the 2016 Rio Olympic Games, will be course designer for the CSI. “The Kentucky Three-Day Event is well established as one of the world’s premier equestrian events,” said Derek Braun, Founder and CEO of the Split Rock Jumping Tour. An internationally-recognized show jumping series now in its third year, the Split Rock Jumping Tour attracts an impressive line-up of Olympic veterans and international riders.Split Rock events give competitors, sponsors and spectators an “Unparalleled Show Jumping Experience” with world-class venues, top prize money, extravagant awards and numerous first-class amenities for riders, horses, owners, sponsors and spectators. The Kentucky Three-Day Event is one of the world’s most prestigious equestrian competitions and features the world’s best horses and riders vying for their share of $400,000 in prize money as well as a shot at the $350,000 Rolex Grand Slam of Eventing, which is awarded to any rider who wins the Kentucky, Mitsubishi Motors Badminton and Land Rover Burghley Four Star Events in succession. Further information about Split Rock Jumping Tour is available on line at the Tour’s official website at www.splitrockjumpingtour.com. Further information on the Kentucky Three-Day Event is available at www.kentuckythreedayevent.com.